“Being able to accept SNAP expands access to our market for families who use these benefits. Rather than shopping at the grocery store, accepting SNAP at the farmers market opens up the opportunity for families to enjoy fresh local produce,” says Laura Tenner, sustainability associate with AAMC. The Maryland Market Money program also includes shoppers using other benefits, such as Woman, Infants and Children Fruit and Vegetable Checks and the Farmers Market Nutrition Program (FMNP). The program, which launched in 2013, helps food-insecure Marylanders stretch their budgets and farmers markets grow their customer base. According to the Maryland Food Bank, about one in eight Marylanders is food-insecure. This means they don’t have consistent access to adequate food. In the last four years, customers have spent more than $1.1 million in nutrition benefits at farmers markets offering Maryland Market Money. 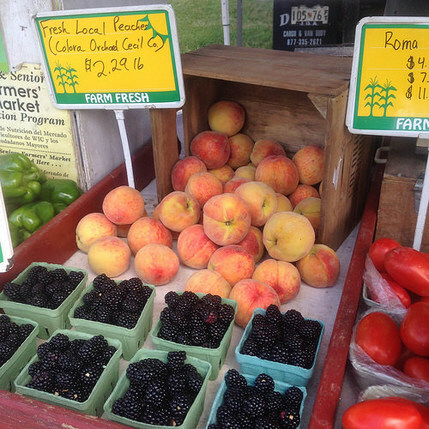 This year, there are 23 farmers markets in the program. AAMC’s market is one of two in the county to be part of the program. The other is the Brooklyn Park Farmers Market, which is run through Anne Arundel County Public Schools. “We’re very excited to get it at the AAMC market,” Brosius says. The program has won praise from advocates of locally sourced food. “The closer you can eat to the source of your food, the better,” says Bethany Tuthill, manager of Priapi Gardens. The organic produce farm will be at the AAMC market this year. “Freshly harvested fruits and vegetable taste better, last longer and have a higher nutritional content. You also help strengthen the local economy and local food security by supporting farmers in your region,” she says. ​ The AAMC Farmers Market is open Fridays from 10:30 am – 1:30 pm from June 2 through Oct. 27. It is held in the Hospital Pavilion South (ground level) located at 2001 Medical Parkway.